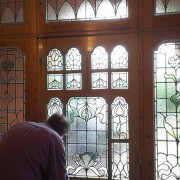 These are some beautiful Edwardian windows we renovated for a couple in Weybridge. Some of the panels we stripped down and re-built, others needed a couple of on-site repairs and strengthening bars added and some just a re-cement and polish. Here, Michael is just adding the finishing touches to the installation. Although these windows are completely colourless the different textures are very effective as they catch the light and have a lovely depth to them.